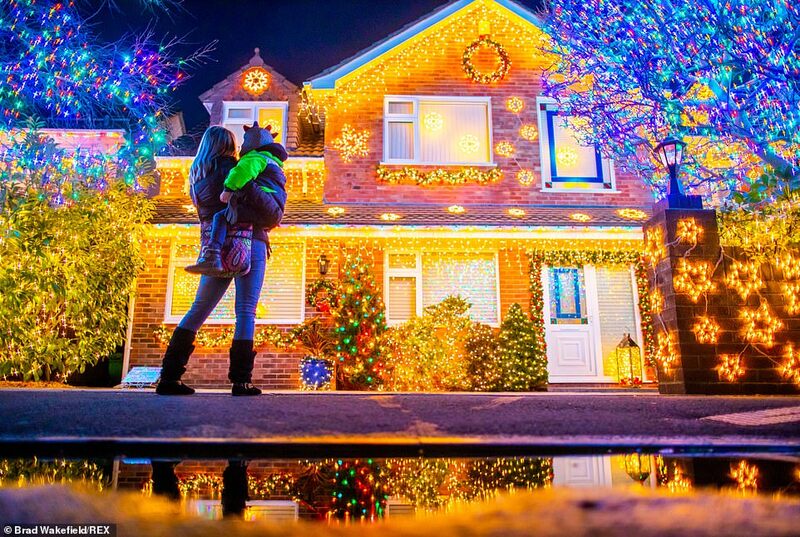 It’s only the first week of December but families across the country are well and truly embracing the Christmas spirit and covering their homes with thousands of lights and decorations. The most festive streets in Britain are drawing crowds from as far away as China as tens of thousands of twinkling lights cover the country. 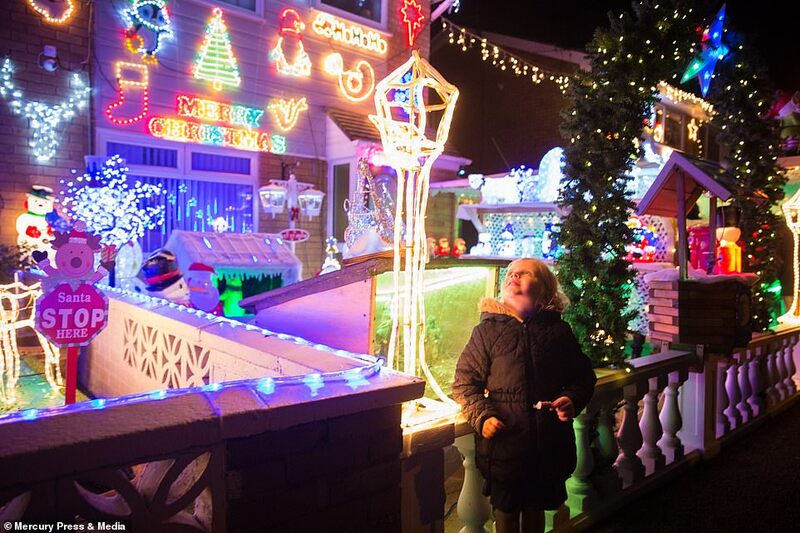 Among the sparkling seasonal streets is one on the Wirral in Merseyside, where a couple have collected £20,000 for charity over 20 years, while a festive fan in East Sussex has covered his home in nearly 10,000 decorations. 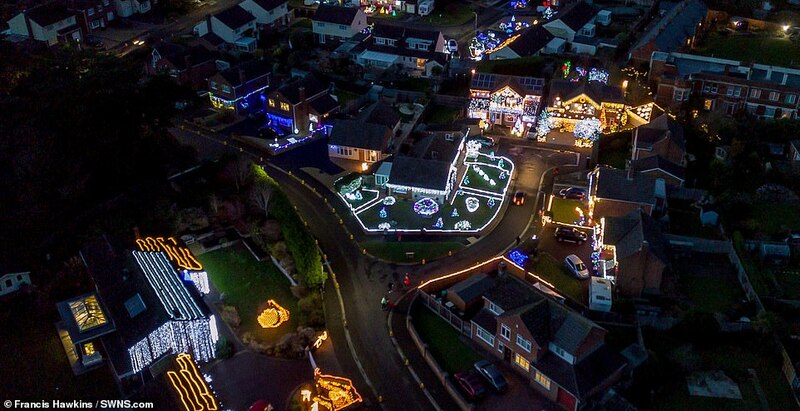 And Trinity Close in Burnham-On-Sea, Somerset – dubbed ‘Britain’s most festive street’ – has a display of more than 100,000 lights. It has been organising the display for ten years, raising nearly £100,000 for charities. 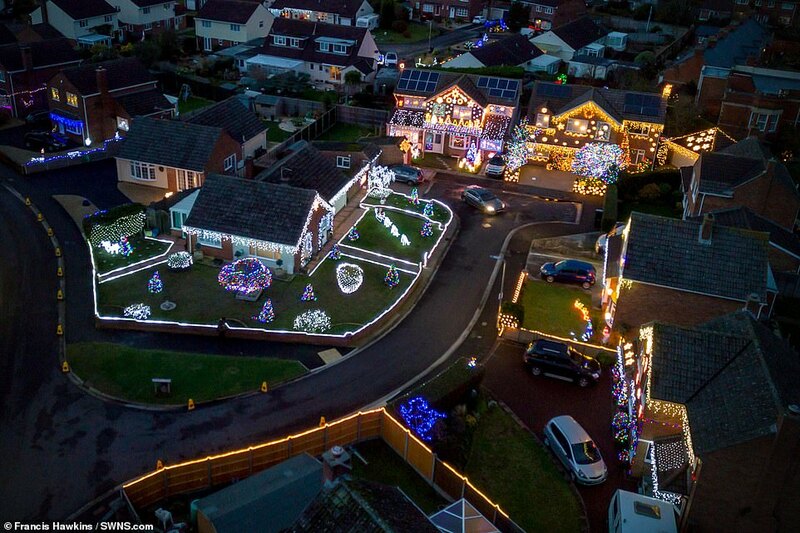 Meanwhile, in another part of the country one couple who love Christmas have spent the last five weeks covering their house in festive decorations for the twentieth year running. 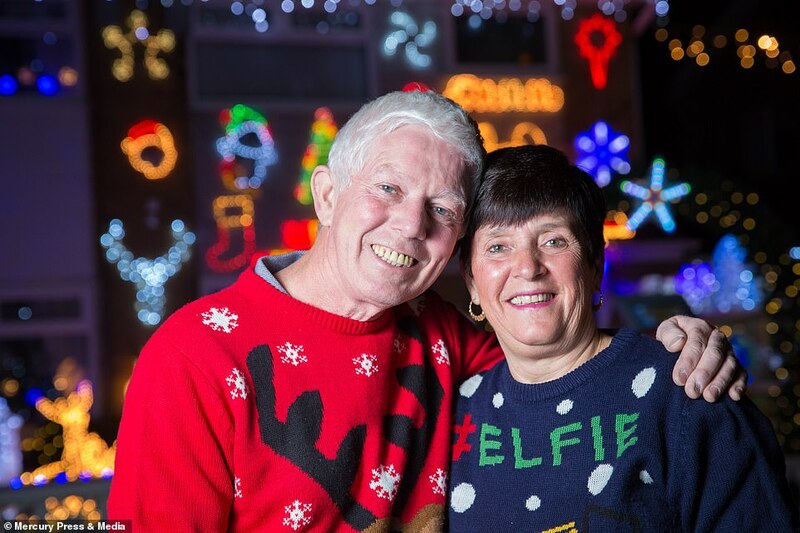 Karen, 55, and Frank Williams, 56, have been decorating the front of their house, in The Wirral, for the past 20 years to give their neighbours some festive cheer. 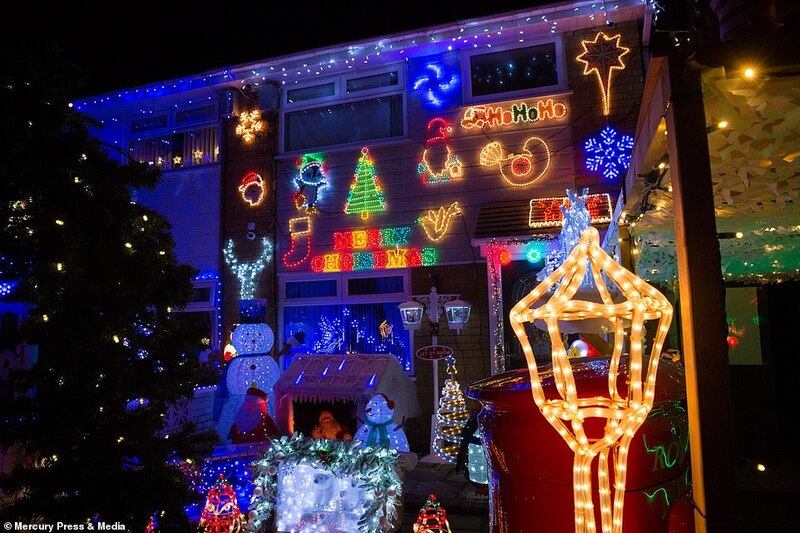 And, with some encouragement, the couple convinced the rest of the neighbours to join in and decorate their houses – meaning that the Saughall Massie street could be one of the most festive in the UK. Karen, a painter, said: ‘We’ve been doing the lights for the past 20 years and we’ll be doing it until we have our last breath. ‘Myself and Frank started putting our Christmas decorations up at the end of October, and just finished recently. Then when ours are done, I go and help the neighbours do there’s too. 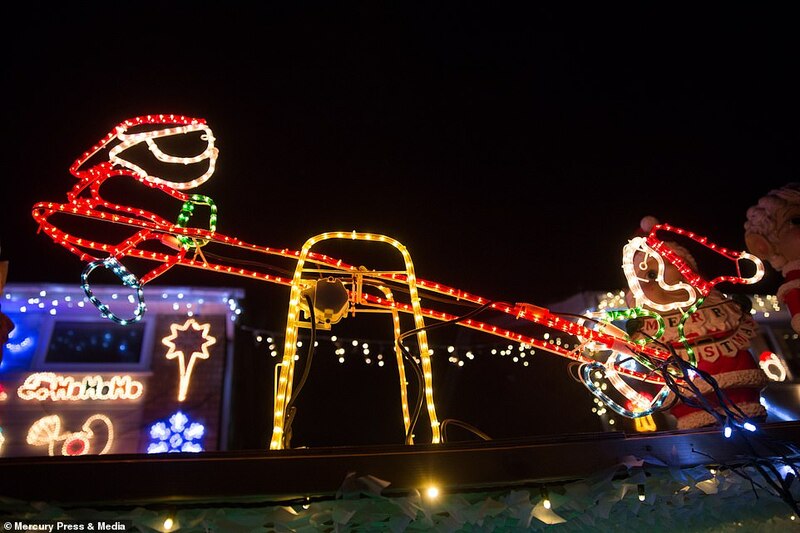 ‘We did the big Christmas light switch on last Friday (November 30), where everyone in the street turned theirs on in unison.I love Christmas, but mainly it’s about seeing the enjoyment on the children’s faces when they see the lights. Alongside decorating the house, the Christmas fans also keep the magic of Christmas alive in other ways. She said: ‘We keep a post box outside of our house, and children can post their letters to Santa in there. ‘Then every night, I take all of the letters and write letters from Santa back to send to the children. I usually get through 350 letters a month. 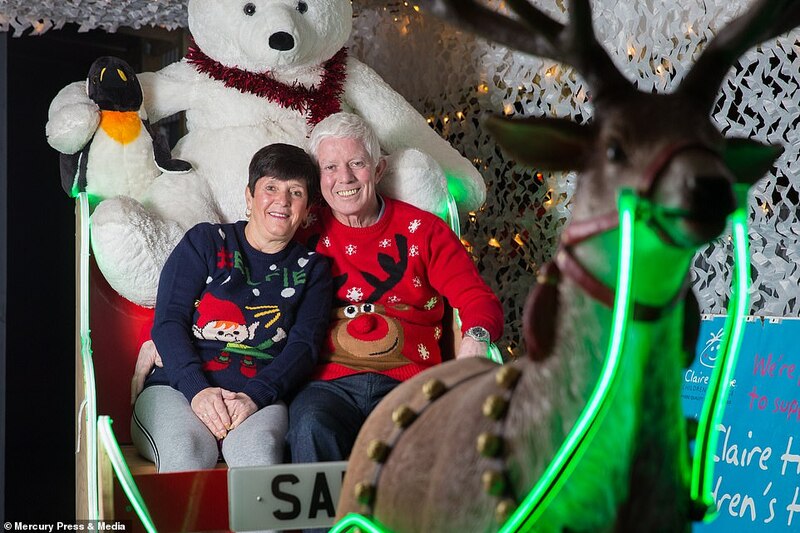 ‘And Frank has dressed up as Santa for years – he puts on his £350 suit and hops on the sleigh he built outside. 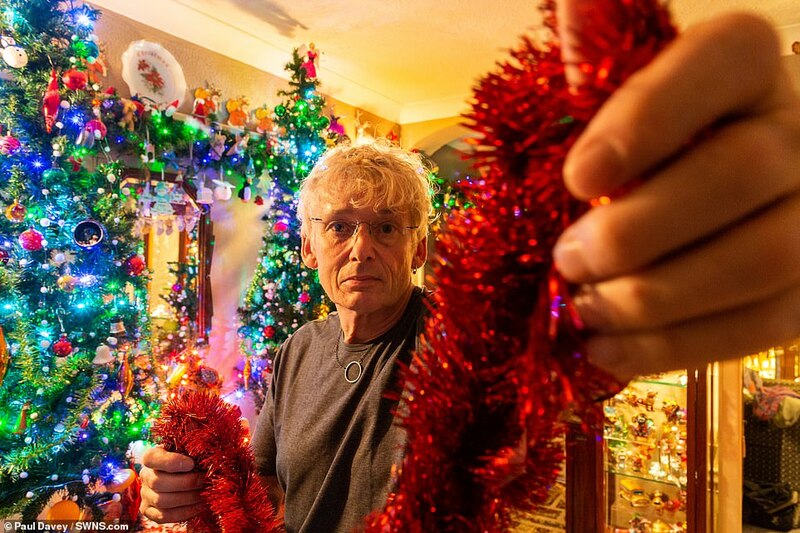 A festive super-fan has filled his two-bedroom home with dozens of trees and nearly 10,000 decorations – even though his partner hates Christmas. 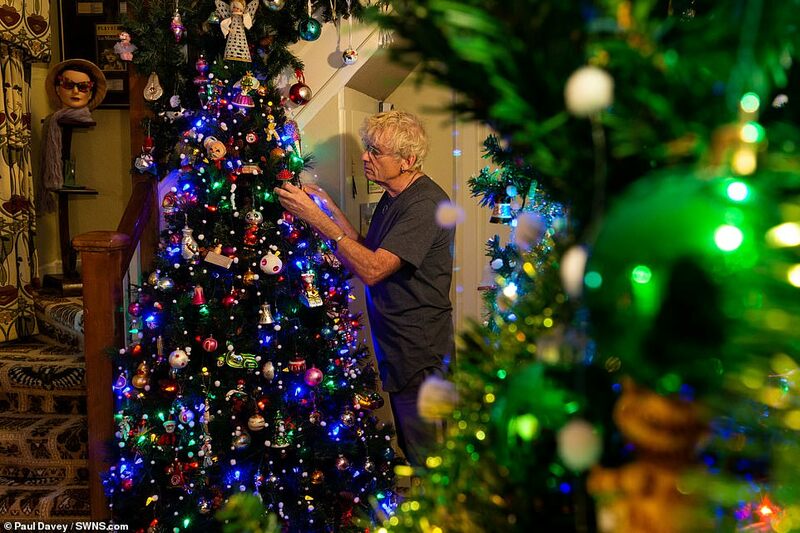 Gardener Geoff Stonebanks, 65, has nearly 4,000 baubles and 3,100 lights which take him almost a week to put up on thirty trees. The £10,000 collection, which started in the 1960s, is now one of Britain’s biggest and includes pieces which date back eight decades. 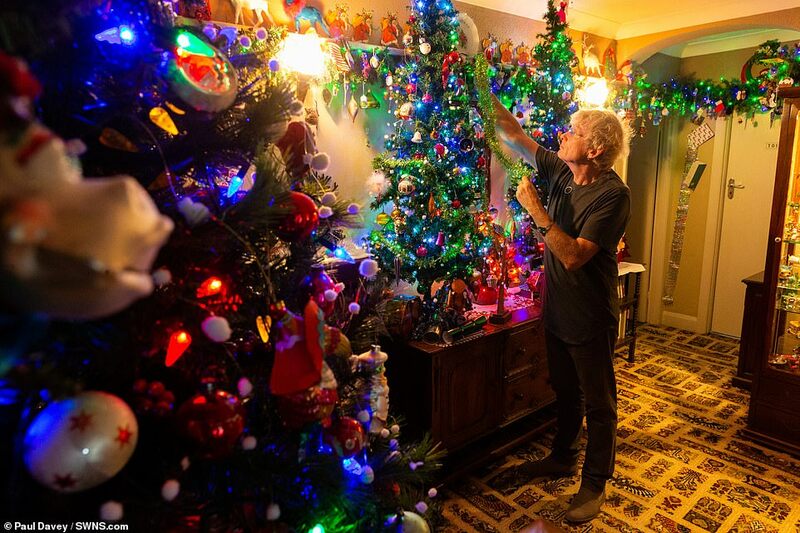 The display begins in the fully decorated ‘entrance hall’ of Geoff’s bungalow, with vintage decorations across a 12-metre garland surrounded by seven trees. 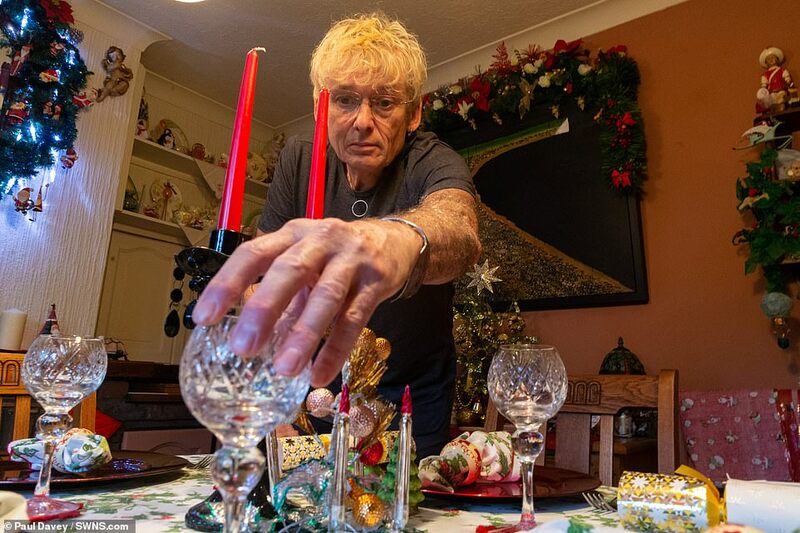 But Geoff admits his partner of 18 years, Mark Glassman, 58, finds the month-long display ‘depressing’ and avoids spending time at their home, in Seaford, East Sussex. Geoff’s passion for decorations began as a child in the early 1960s, when he was tasked with decorating his parents’ country pub, The Dolphin, in rural Oxfordshire. He said: ‘I’m a child at heart to be honest. It just started when we lived in a village pub and had a regular clientele I suppose. ‘During the run up to Christmas having broken up from school, I was bored and my mum used to do it and I decided to take over from her. He remained in charge of the pub’s decorations until his parents retired in 1987. But he had also started amassing his own collection before that, when he bought his own house in 1979. The decorations include antique pieces from 1930s Prague, contemporary modern ornaments – and hundreds from former high street favourite Woolworths. Geoff added: ‘There’s a whole collection of wooden decorations from America, a lot of glass and some from the 30s, 40s and 50s, it’s a lot of money. I generally buy more contemporary ones year on year. Geoff added: ‘I love Christmas, but my partner hates it, although he has to tolerate my decorations. ‘It takes a week of full-time decoration to erect them all and the tree in the living room takes a day on its own. A man is selling his family’s 80-year-old Christmas tree. The tree, bought at Woolworths in the 1930s, has been in Steve Rose’s life at Christmas for every one of his 74 years. As a child, he remembers his mother decorating it and, though his parents are long gone, he has maintained the tradition. 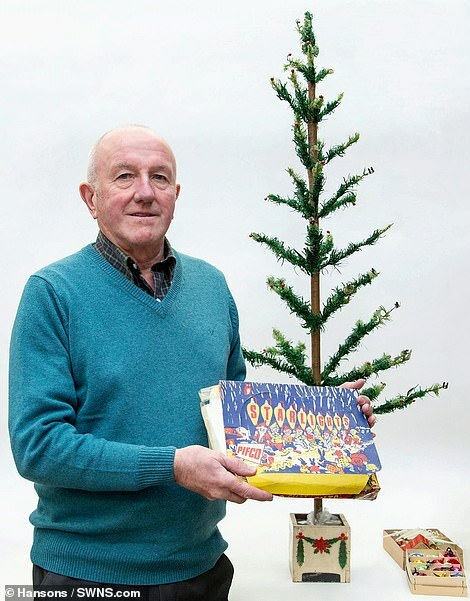 The sparse tree, one of the first mass-produced trees ever made for the famous department store, is set to be sold on December 18, along with more of Steve’s Christmas collectables – 1950s Woolworth Christmas tree lights, still in their original box, baubles and glow-in-the-dark icicles. The tree, which is thought to date back to 1937, sits in a painted pot and has a few sparse branches featuring the odd goose feather dyed green and a sprinkling of red berries. It is expected to fetch between £200 and £300. Steve, a retired biology teacher from Syston, Leicestershire, inherited the tree when his mother, Florence, and father, also called Stephen, passed away. He has used it every year up until eight years ago and is parting with his yuletide heirloom because he has no children to leave it to. He confessed it did cross his mind to throw the tree in the skip once and although he was glad he didn’t, it was time to say goodbye to the sentimental collection which gave him such happiness as a boy. He said: ‘It was our main family tree for years and I remember my mum putting it up every Christmas. I’ve had it all my life. ‘Christmas was not an extravagant affair when I was a child growing up in South Wales. ‘In the late 1940s you’d get a Christmas sock and inside it was a tangerine, nuts, some loose change and small presents. It was very simple but enjoyable. ‘On Christmas Day we had a chicken from the lady at the back of our house who bred them. ‘I think we enjoyed Christmas more back then. Because we didn’t have much, we valued what we did have. ‘I was given a train set when I was 11 and I only parted with that eight years ago. It was still in mint condition with its original box. ‘These days, some children get thousands of pounds spent on them and don’t appreciate it because they’re used to having so much. ‘My father had to start work down the mine at the age of 13 because his mother had been widowed twice, there were four children to feed and the rent had to be paid. He worked in mining for 49 years. 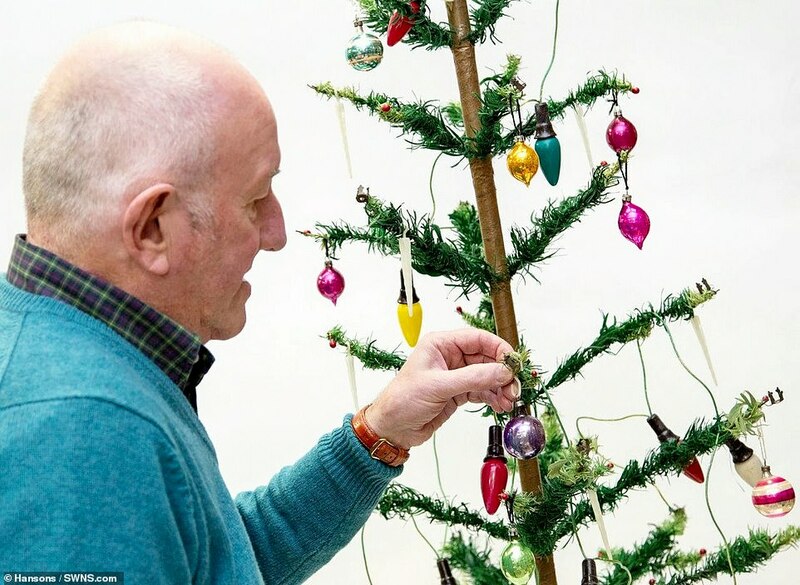 Now Steve, who has lived in Leicestershire for 51 years, is looking forward to Christmas 2018 – but without his family festive tree. Last Christmas, a similar tree – without any decorations – sold for £420 at Hansons and was bought by the American Christmas Tree Association. Department store Woolworths started selling some of the first mass-produced artificial trees in the 1920s.